Our phones are the closest things we have to personal assistants. They are our lifelines. They keep us connected and up to date. They wake us up in the morning and let us know what to wear based on the weather. Most of us would admit that it would be pretty difficult to go even a single day without our phones, and there’s nothing wrong with that. We are better informed and we feel more secure. Our phones keep our kids safe and help old friendships thrive. So what happens when you can’t count on it? Having your phone die on you regularly and unexpectedly can be distressing. However, knowing whether this issue is caused by the phone itself or the battery will help you know which steps to take in order to fix the issue. I’ll start by saying that according to payetteforward.com, “When you plug in your iPhone, its software decides whether or not to charge the battery.” That being said, if the issue isn’t the battery, it’s either the software or the charging port that’s causing the issue. The first and simplest thing you can do is check the quality of the devices you are using to charge your phone. After that, you can check the cord itself. Did your cat chew it? If so, a new charger is in order. Next would be to try a different adapter and the last at home test would be to try a different power source. However, if the answer isn’t that simple, then take it to a professional and have them test the battery by replacing it. You should also consider the age of your phone. If you’ve had your phone for two plus years and it has never experienced any former traumatic incidents (ie. dropping it in water or down a flight of stairs) then the issue is most likely the battery. Batteries age over time and become less effective. 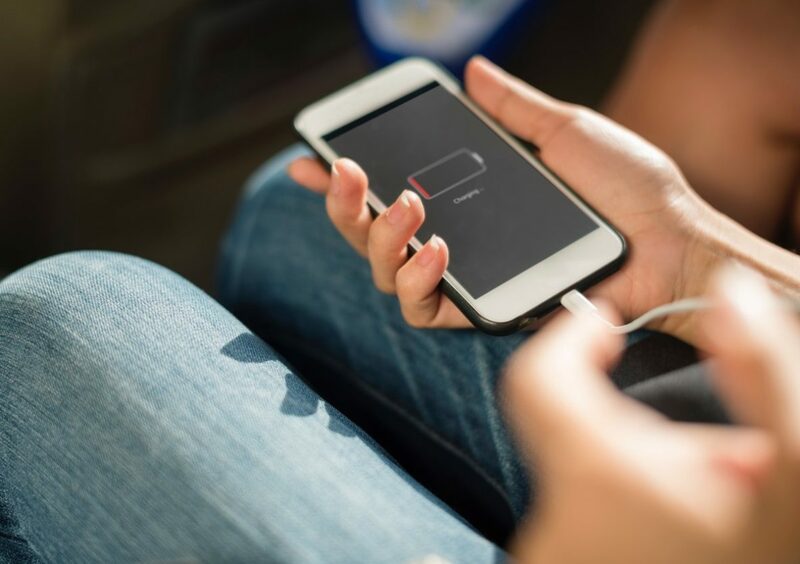 According to The Telegraph Our phones have between 300 and 500 charging cycles before the batteries reach about 70% of their original capacity. It’s at this point that the lack of charge will become pretty evident. The cost of a new battery is much less than that of a new phone, however when a phone is over two years old there may be other internal issues. If faced with this dilemma, you can take your phone to a repair professional for advice as every situation will vary. If your phone is fairly new and has not experienced any extreme trauma, then the issue could be the charging port. Sometimes it just needs a good cleaning to remove any lint, dust, or crumbs. When cleaning your port, be very careful and use something with gentle bristles such as a toothbrush. If it’s more than just Dorito cheese blocking the charge, you’ll want to get it checked out. According to cellphonerepair.com, charging ports can get damaged by dropping your phone, or tugging on the charger too aggressively. In many instances, phone repair professionals can fix the port using tiny specialized tools. This is not something you should attempt on your own as the parts of your phone are extremely delicate, so the smallest slip could lead to much more extensive damage. This issue is no doubt annoying and frustrating, however, the fact that a faulty charge can only be caused by a finite number of things makes it easier to determine a game plan moving forward. Copyright 2017 Phones R Fixed, Inc. All rights reserved.